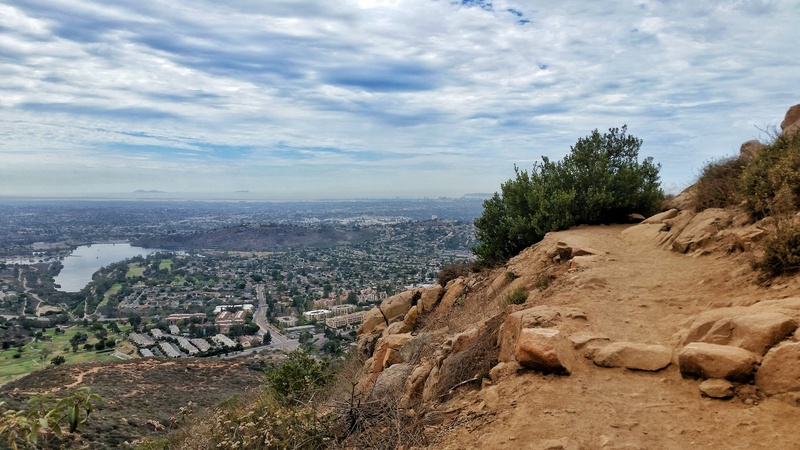 Cowles Mountain is the highest peak in San Diego, at just over 1,500 feet. 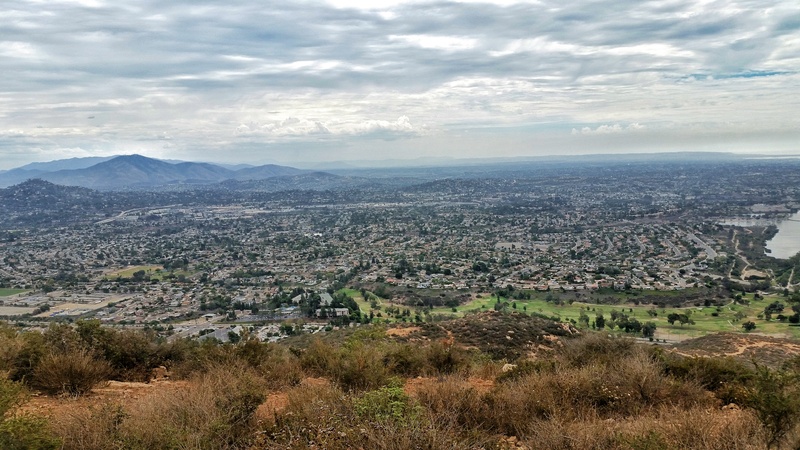 It is also the most popular hike in San Diego, said to receive even more daily visitors than Mount Fuji in Japan. Christina was in San Diego on a business trip, departing a few days before I arrived. I decided to rendezvous with her there once her conference was over, because I couldn’t resist a quick trip out to southern California. I flew out early on a Thursday morning, and immediately went from the airport to Cowles after picking up my rental car. We typically travel as a couple and do all of our hikes together, but this was a rare exception where I would be living the solo travel life for a day or so, and I really wanted to do a challenging hike. In doing my research for this particular hike, I read that due to its popularity, you typically need to park along Golfcrest Avenue, quite a distance from the actual start of the trail due to its popularity, no matter what time of day or day of the week. However, I just happened to arrive in San Diego during the peak of a rare heat wave that was afflicting southern California at the time, and so when arriving at the parking area at the staging area for the hike, I found plenty of open spots in the very small lot. The heat and humidity was oppressive, to say the least. San Diego is famous for its temperate, perpetual 70 or so degree weather, no matter the time of year, so arriving to 95+ degrees heat with insane humidity was not what I was exactly ready for. 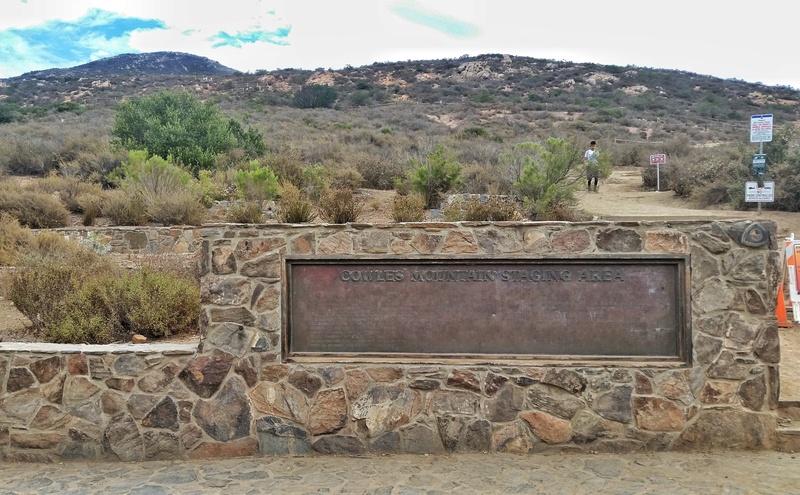 At the entrance to the hike, there were numerous temporary signs in place warning visitors not to bring their dogs on the trail because of the heat and lack of water, and informed all hikers that a dog had died just 3 days prior of heat exhaustion. As a result, many visitors had kindly placed dog bowls filled with water at the summit of the mountain for those idiots who still thought it might be a good idea to bring their furry friends along. When I was on the trail, I only encountered maybe 10 other hikers, and mercifully, none of them brought their dogs along for the journey. 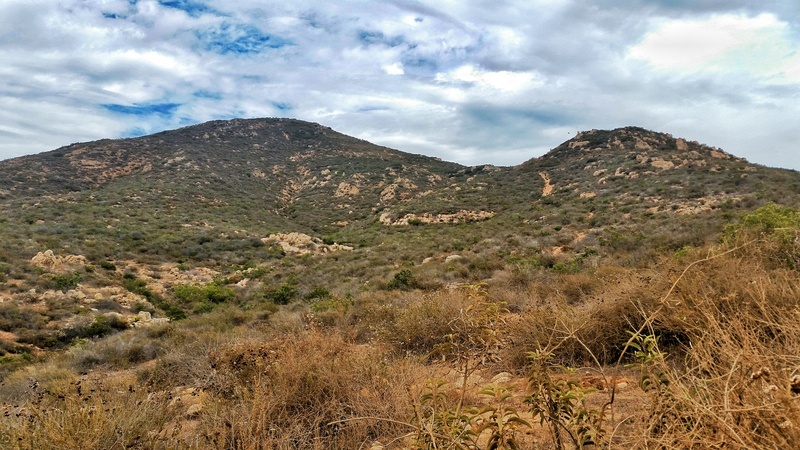 The trail rose steadily right from the start, and after surpassing the smaller foothill, once the rise to the summit began, there were a series of switchbacks that led all the way to the top. The views as you climbed higher above the city became more and more impressive. Despite the heat, I would call this a moderate hike. I saw a few people turn back right before the switchbacks began, but they weren’t terribly strenuous, and I’d say overall it took about an hour to make it all the way up. It was a very sweaty hike, but the breeze was nice once at the top. The summit was noted with an American flag flying, with numerous dog bowls at the base. 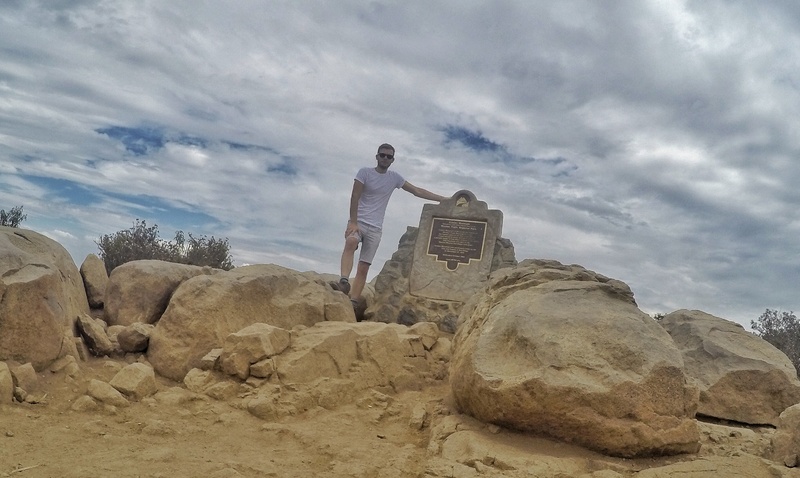 At the very top, your hike is not complete until you tap the placard that designates the highest peak in San Diego. While hanging at the top, I witnessed many weary hikers and runners huff and puff their way to the placard, tap it, and then begin the long slog back down the mountain. 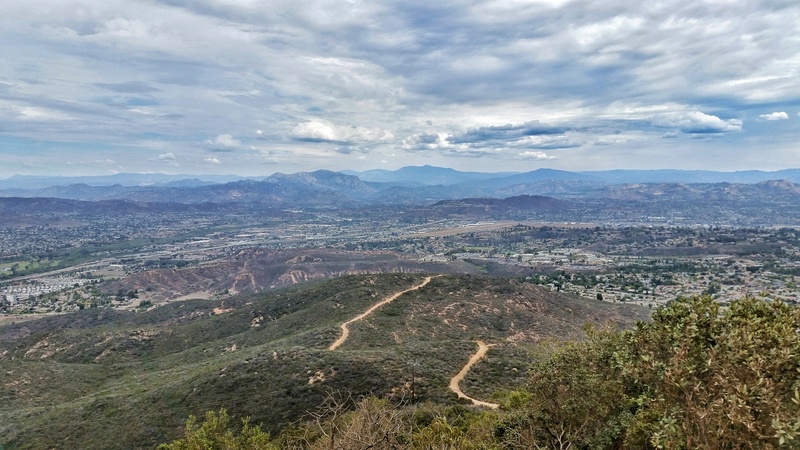 Here you will find amazing 360 degree views of San Diego and the surrounding cities, and all the way out to the Pacific. It’s a great introduction to the city if it’s your first time visiting San Diego, as it gives you a bit of perspective on the layout and landscape of the area. There is wild sage that grows all along the trail, giving a very pleasant scent as you make your way up the mountain. On a normal visit, plan on parking somewhere along Golfcrest drive if the lot is full – all parking on the street is free. Make sure and bring plenty of water, as the trail is very dry and there are no water sources along the way. 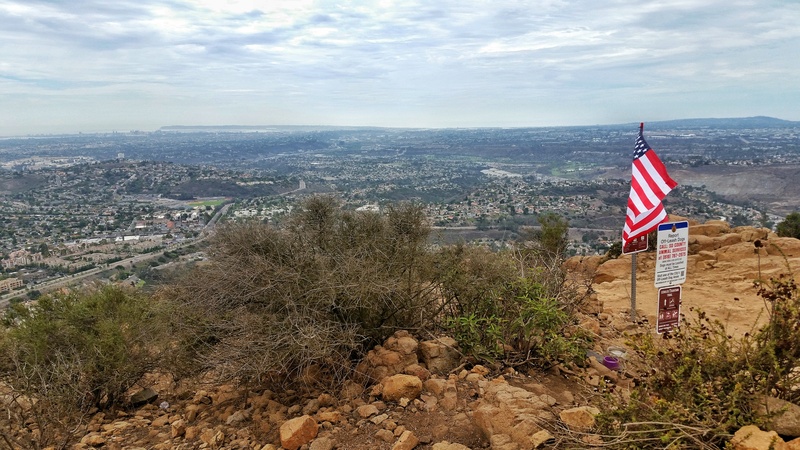 Reward yourself when finished with a refreshment at Cowles Mountain Coffee Co. right at the base of the mountain, or drive into San Diego proper and grab yourself a burrito and beer to congratulate yourself for a hike well done!